Magicians spend countless hours preparing and practicing for their big show of illusion, and they never expose their secrets. Like magicians, the MCGI cult puts forth considerable effort in the clever and manipulative preparation of their unbiblical teachings to present ingenious statements and masterful arrangements of misleading propositions. Claims of having unique guidance from God is a red flag characteristic utilized by all religious cults. There is absolutely no evidence that God guides Soriano and his cult the Ang Dating Daan with all the falsehoods being spewed by Soriano day by day. Proselytizing and preaching the good news to recruit new members is a common characteristic of religious cults. Elitist and inaccurate claims are made by Soriano and his followers regarding their belief that they are the only Church doing the preaching work that Jesus directed. Technically this is true, but only through MCGI trickery. This supposed good news that MCGI Members refer to is that Soriano is their god and sensible preacher, unlike true Christians who proselytize that Christ their GOD. Cult leaders teach that effective preaching work along with collecting donations is the mark of dedicated and faithful members; those who are proud to stand up for the so-called “truth”. Through such false claims that “unlike Christendom we do not solicit for tithes in the preaching work”, this is the very tricky tactic used by ADD leaders to receive more financial contributions. There is no real difference between a collection plate from the churches of “Christendom” to a contribution demands solicited by the ADD. The only difference is that ADD leaders recognize this humble approach is far more effective in the mass consumption of finances. Religious cults are known for fabricating their own translations of the Bible to support their own doctrines. For example, the Iglesia Ni Manalo cult has their own fabricated Lamsa Translation Bible while the Jehovah’s Witnesses (WTS) cult have their own New World Translation Bible. The Ang Dating Daan is one most prime example of this cult characteristic. Through the “Ang Dating Biblia”, loyal ADD followers are tricked into believing this uneducated fabrication is scholarly and accurate. And although it appears as though MCGI Members are knowledgeable about the Bible, behind the smoke and mirrors lies manipulated followers with highly selective use of Scriptures. 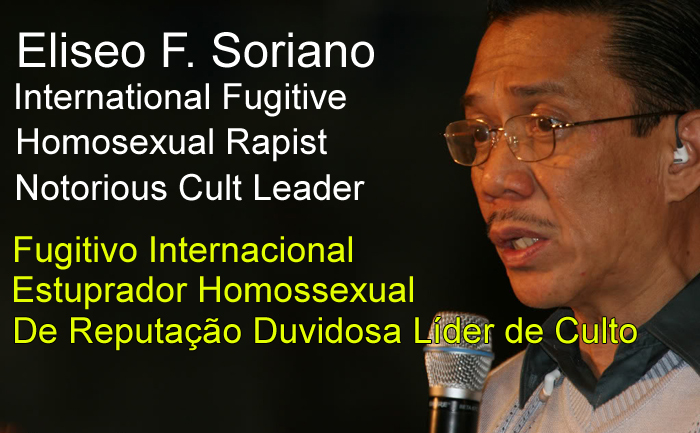 Soriano intentionally trains his followers to recite flag mark Scriptures which pertain only to their own doctrines. All religious cult leaders utilize this trick as a preventative measure, in fear of losing loyal followers to real Christianity, a place where no human liaison is required. This entry was posted in ADD Members-following a false preacher, ADD-'a fool God and a wise Preacher", ADD-a greedy business empire, Bag of Tricks and deception, Eli Soriano-a maw of a false Preacher, How the MCGI/ADD is a CULT, Lies and deception, Lies and Misinformation, Rebuttals and tagged ADD cult, Bag of tricks, Black and white thinking, Eli Soriano-a maw of false Preacher, Lies and deception, Lies and Misinformation, Rebuttals, Regurgitated nonsense and lies, Rhetorical fallacies and false reasoning. Bookmark the permalink.